This is a condensed version of his interview. Click Here to View the Full Version available to members or for purchase on a pay-per-view basis. Rodrigo Pessoa inherited his passion for horses, equestrian sport and learned how to ride from his father the great Nelson Pessoa. At the young age of 9, Rodrigo began competing with Ponies in England, by 12 he earned his first title of many to come ‘Champion of Pony Class’ in Belgium. At 16, he started competing in the most prestigious Grand Prix in Europe, and in 1988 he won the Junior European Championships, but could not take the title home because of his Brazilian citizenship. In 1992, at the young age of 19 Rodrigo went to his first Olympic games in Barcelona, this was to be the first of many times he would represent Brazil on the Olympic stage. In 1994 he helped the Brazilian team win team Gold at the Pan-Am games and went on to win another gold medal and two silver medals at the Pan-Am games in later years. 1997 was a big year for Rodrigo as it marked the beginning of a legendary winning streak, he won the Grand Prix of Geesteren, Mannheim and Aachen and went on to win the World Cup Final in Helsinki in 1998 and again in 1999 and 2000 with his famous partner Balobet du Rouet. In 1998 he also won the World Championships (WEG) and took home the “Show Jumper of the Year” award. In 2000 he represented Brazil at the Olympic games in Sydney where he helped clinch the team bronze medal. 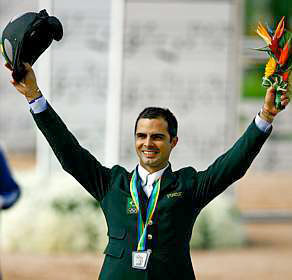 By the end of 2000, Rodrigo had already won 23 competitions, had 10 second places, won the World Cup Final, and an Olympic Medal resulting in him being ranked #1 on the FEI World Rankings. Rodrigo and Baloubet du Rouet’s winning streak was far from over, in 2004 he rode to victory in 6 major Grand Prix events and won the individual Silver medal at the Olympics in Athens. 2005 was the year in which Olympic Silver turned into Gold, on 29th of August in Rio de Janeiro, Rodrigo was awarded the long awaited Olympic Gold Medal. In 2006 Rodrigo began a partnership with Hunter Harrison and Double H Farm, he and new mount ‘Oasis’ won Falsterbo (Sweden), Lanaken and Brussels (Belgium) sadly ‘Oasis’ unexpectedly passed away in 2007. As a result 2007 became a rebuilding year for his team, with the purchase of Rufus and Cantate Z as the great Baloubet de Rouet was no longer competing. Rufus went on to win the Pan-American Team Gold Medal and Individual Silver after just seven months with Rodrigo. 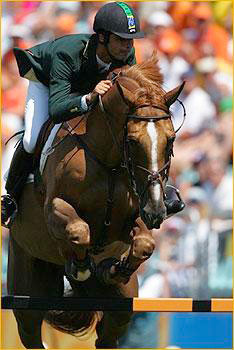 In the year 2009 Rufus went on to place 5th individually in the Rolex World Cup Final and win several Grand Prix titles. In 2008 Rodrigo teamed up with HH Let’s Fly the pair has won Grand Prix events all over the world including, CSI Jacksonville, CSI 5* Charlotte and CSOI 5* Rome along with top placings in Global Champions Tour Grand Prix events. 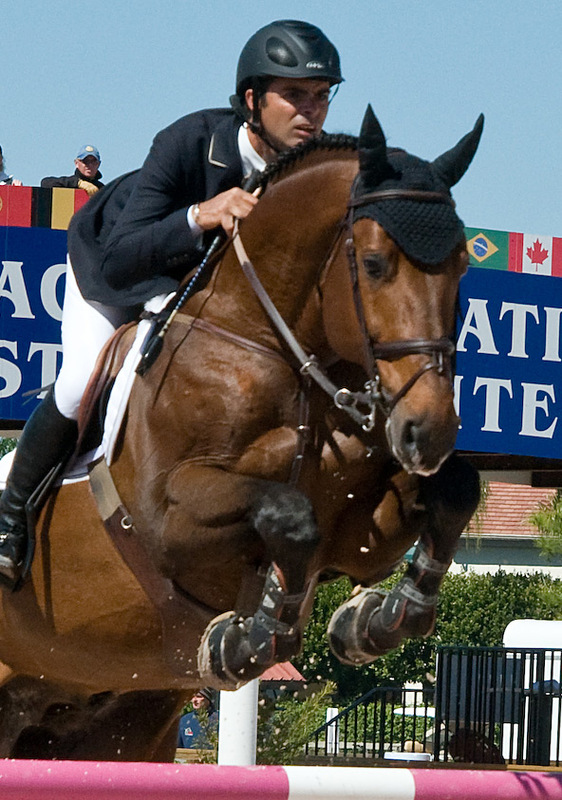 In 2011 they won the FTI Winter Equestrian Festival’s FEI World Cup Grand Prix (this round is featured on EquestrianCoach.com). Rodrigo Pessoa has won over 71 Grand Prix wins and 5 Derby wins from Aachen to Spruce Meadows proving time and again that he is one of the best in the world. “Special Envoy was remarkable because he was the horse that really started my career. He was the one that launched me in the great international circuit. I did my first world championships with him and my first Olympics. I've been lucky to have many quality horses, but if I had to choose one, he will always be "Special"”. “My father. Since the early beginning he has been my greatest support, my major inciter, my supreme coach. Without him, without the experience he's gone through, without the opportunities he's granted me, I guess I would not be here today. My great companion with whom I always had a fantastic relationship, and he is a person to whom I owe a lot. Get to know Rodrigo Pessoa from his introduction to the sport to his biggest influences. In this interview, the renowned Olympian and World Champion talks about the experiences, the people and the horses that have helped shape his successful career and what his goals are for the future. Get to know Rodrigo and his great horse HH Let’s Fly while they school over Rodrigo’s favorite gymnastic in preparation for the $231,000 FEI World Cup Grand Prix CSI 4* during week 9 of the Winter Equestrian Festival in Wellington. This topic focuses on the partnership of horse and rider and features Rodrigo’s play by play of his winning round. This is a condensed version of this interview. The full version is available to members and on a pay-per-view basis. Click here to view the full version.